London is blessed with such a variety of buildings - old and new, traditional and modern - that the skill in the design and details obscures how much they depended - and still depend - on timber. A particular historic splendour is expressed in wooden floors, in numerous examples going back to the Tower of London, progressing to Kenwood House, and not forgetting the glorious interiors of the City of London churches. If your floors have become neglected, damaged and worn by years of unforgiving feet - or even lie choked under carpets, now is the time to liberate them. Wood floor sanding is a tried and trusted technique that can restore the saddest floor to a glorious future. So call on experienced floor sanding professionals. 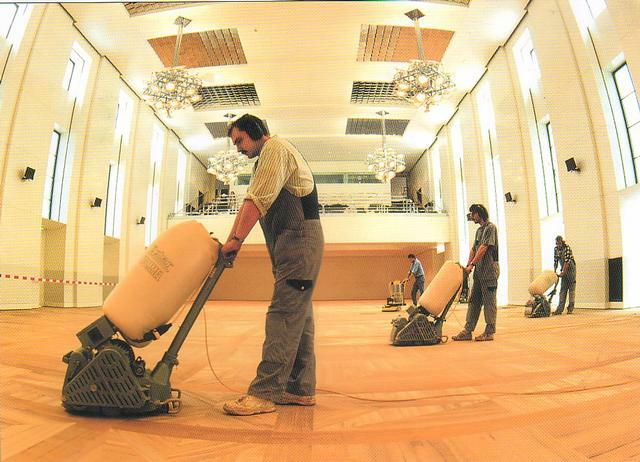 London Floor Sanding provides a comprehensive wooden floor repair service throughout inner and Greater London. Floor sanding is not a complex task, but you will still want to hire a reliable firm with a clear understanding of how sanding affects the final surface finish. The standard belt sanding process consists of three stages: a rough, medium and fine sand to strip, level, and smooth the boards or parquet blocks to leave a high quality finish. And the job needs to be thorough: we use the latest floor sanding technology to get right into the corners by using dustless edging sanders and fine Bosch tools for a complete and even sand. Having restored all kinds of wooden floors for 20 years, we know all the inside secrets of the trade. Our staff members are trained to the high standards of the National Wood Floor Association (NWFA) with a minimum of seven years’ experience in the floor renovation industry. Please phone or email today for a no obligation quote. Banish that ugly leftover concrete slab. 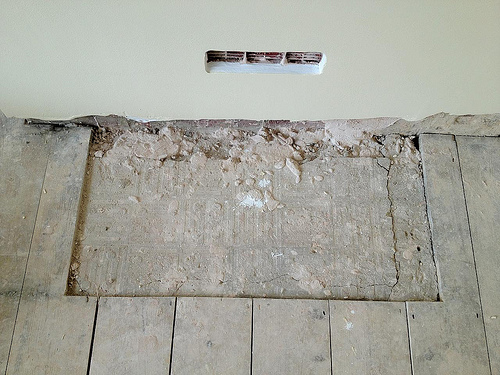 Let us remove redundant fire hearths and fill the space with matching floorboards or parquet blocks. 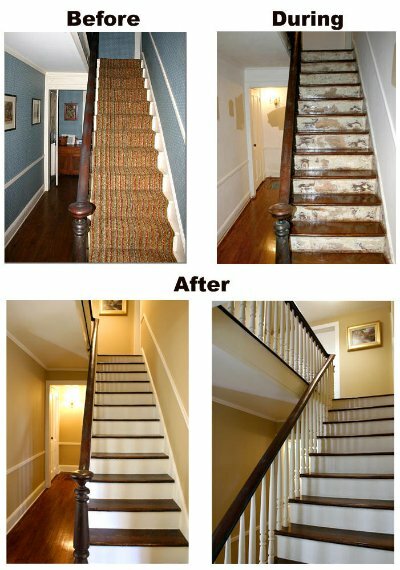 For the complete stair stripping service throughout M25 - contact us today! From schools to museums; bars to restaurants; gyms to offices … Many commercial buildings benefit from a beautiful yet durable wooden floor. It not only withstands high volumes of traffic - but enhances the overall ambience of a workplace or public space. A freshly-restored wooden floor in a shop or eating place can encourage customers to enter, linger and return. You will lose as little business as possible when you close while we work. We aim to minimise disruption to your working day and will work around your particular demands. We work flexible hours and our craftsmen will renovate your floor outside of business hours - at evenings or weekends. Some jobs are quite a challenge: the hairdressing chairs and dryers, not to mention the massage tables at Estee Lauder, all needed to be removed. The exposed floor was a sad sight: hair lacquer lacks the floor-friendly properties of wood lacquer. And the wax used for hair removal could not be mistaken for hard wax oil. So we needed to apply five coats of slip-resistant matt lacquer to the floor - not only for the heavy traffic but to resist the inevitable daily spills of chemicals. This was an overnight job with five teams working over 12 hours, using air conditioning equipment for quick drying of each coat of lacquer. The salon was open for business next day! NW3, HA0, NW10,• Brent Cross, NW2 • Camden Town, Regent's Park, NW1 • Colindale, Kinsbury, NW9 • Cricklewood, NW2 • Cricklewood, Neasden, NW2 • Golders Green, NW11 • Greenhill • Hampstead, NW3 • Hampstead Heath, NW3 • Harlesden • Harrow, HA1, HA3 • Harrow on the Hill, HA1 • Havering • Hendon, NW4 • Kentish Town, NW5 • Kilburn, NW6 • Kingsbury, NW9 • Mill Hill, NW7 • Neasden, NW2 • Northolt • Northwest London • Queens Park, NW6 • Regents Park • St Johns Wood, NW8 • Sudbury • Swiss Cottage, NW3 • Temple Fortune • Wembley, HA0 • West Hampstead • Willesden, NW10. • Balham, SW12 • Barnes, SW13 • Battersea, Clapham Junction, SW11 • Beddington • Brentford, TW8 • Brixton, SW2 • Brompton • Chelsea, Brompton, SW3 • Chessington, KT9 • Clapham, SW4 • Clapham Junction • Earl's Court, SW5 • Earlsfield, SW18 • East Sheen, SW14 • East Sheen • Epsom • Esher, KT10 • Hook • Hounslow, TW3 • Kew, TW9 • Kingston, KT1, KT2 • Knightsbridge, SW1, SW8 • Merton, SW19 • Mitcham • Morden, SM4 • Mortlake, SW14 • Nine Elms, SW8 • Norbury, SW16 • Parsons Green, SW6 • Parsons Green • Pimlico, SW1 • Putney, SW15 • Raynes Park • Richmond, TW9, TW10 • Roehampton, SW15 • South Kensington, SW7 • South Lambeth • South Wimbledon, Raynes Park, SW20 • Southfields • Southwest London • Stockwell, Brixton, SW9 • Streatham, SW16 • Streatham Hill, SW16 • Surrey • Teddington • Tooting, SW17 • Twickenham • Wandsworth, SW18 • Weston Green • Wimbledon, SW19 • Woodmansterne • Worcester Park • Worlds End, SW10.